Our list of new books is now updated. Last month, the Law Library received books on topics ranging from criminal justice reform to shopping malls, demonstrating the wide variety of interests held by our faculty and students. 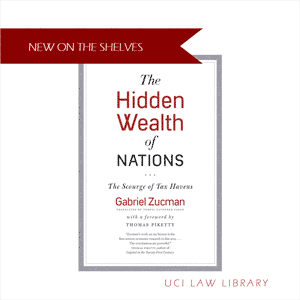 [Zucman] offers an inventive and sophisticated approach to quantifying how big the problem is, how tax havens work and are organized, and how we can begin to approach a solution. His research reveals that tax havens are a quickly growing danger to the world economy. Check it out downstairs in the Stacks at HJ 2336 .Z8313 2015.